P.S. 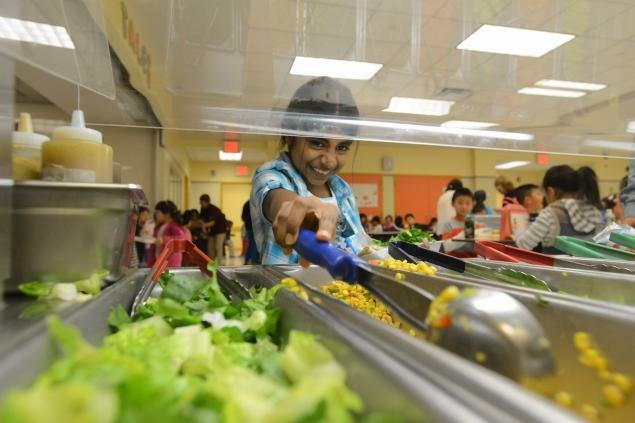 244 in Queens, New York has adopted a 100% vegetarian school lunch menu. As a result, student obesity rates are dropping. I noticed in photographs of the school’s lunch program, children are serving themselves. I think this is very empowering, especially since they are only given healthy options to choose from on the lunch counter. Vegetarian diets have been proven to decrease the risk of heart disease, some forms of cancer, diabetes, high blood pressure and obesity, said registered dietitian Martha McKittrick. It’s also a big plus that the school doesn’t have any vending machines — which are usually stocked with calorie-laden sodas and chips, McKittrick said. “By avoiding junk food . . . you’re going to help decrease blood sugar spikes and then crashes,” she said. PS 244 created with the help of the New York Coalition for Healthy School Food. A high school in Appleton, Wisconsin tried an experiment under the enlightened guidance of their principal, LuAnn Coenen. She wanted to see if she could positively affect the fighting, weapons-carrying and general lack of focus and discipline in the school by changing the food the kids ate. Vending machines were replaced with water coolers; hamburgers and French fries were taken off the menu and replaced with fresh vegetables and fruit, whole grain breads and a salad bar. With the departure of junk food, she also saw the departure of vandalism, litter and the need for police patrolling her hallways. The students were calm, socially engaged and focused on their schoolwork. Problems were minimal. And all Ms. Coenen did was change the menu! Please watch “Forks Over Knives” for FREE to learn more about the implications of a meat-based diet vs a plant-based diet. Go to http://www.hulu.com/watch/279734 and do yourself and your family a favor!